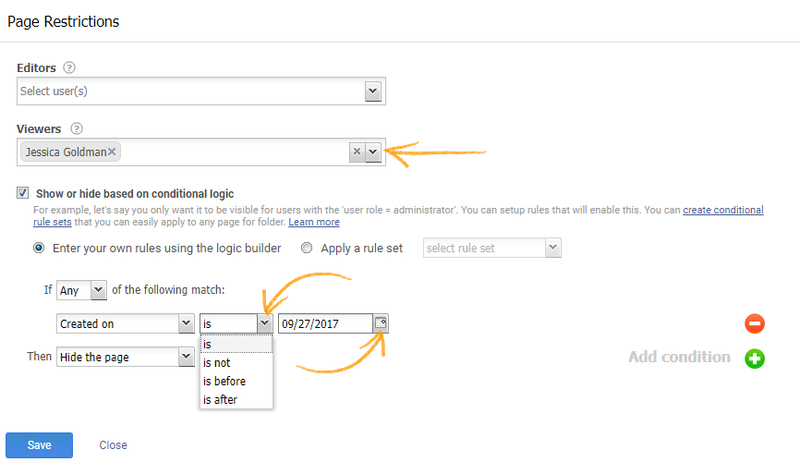 You can add conditions at the page level and choose to display or hide certain pages from your customers or employees, in your help-site. 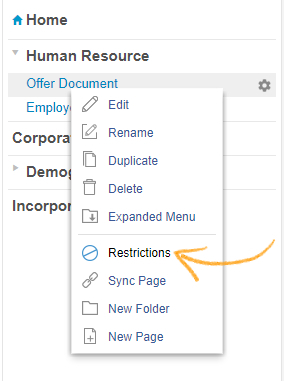 Grant editing access to only authorized employees - You can create your own conditions to allow only authorized content-managers to edit the page, while hiding it from other employees and stakeholders. Show or hide pages from customers or partners - Likewise, you can choose to show the page to only select customers or partners while hiding it from others. 1. Locate the page, Right click on the page name to open the pop-up menu, then click "Restrictions". 2. 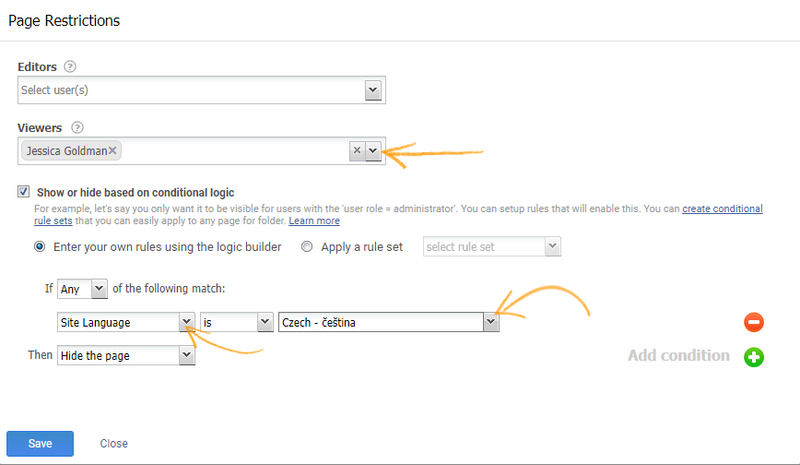 Under "Page Restrictions", select the users to restrict page viewing for them. 2. 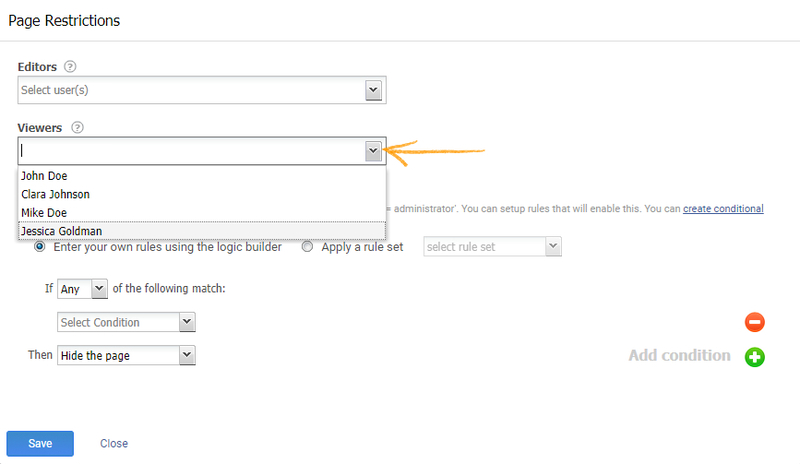 Under "Page Restrictions", from the "Editors" drop down menu select the users to restrict editing for them. 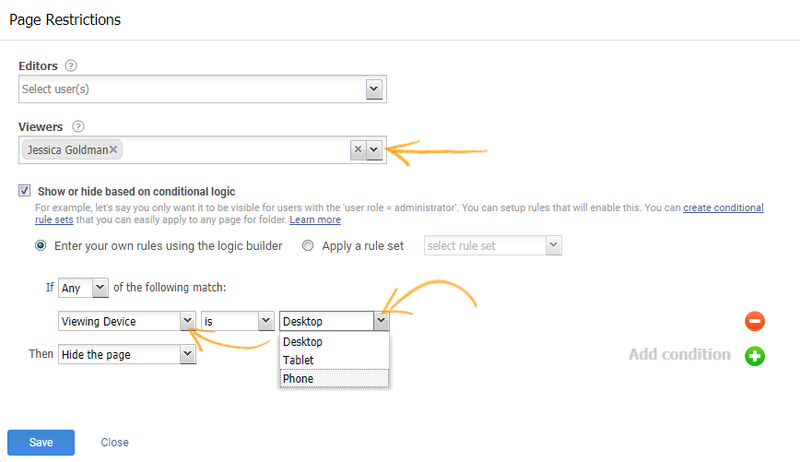 You can restrict users from editing or viewing a page based on the device they are using to access your help site. Select the users you want to restrict editing or viewing to and then select “Viewing Device” and choose the device. You can restrict users from editing or viewing the page based on the language of your help site. Select the users you want to restrict editing or viewing to and then select “Site Language” and choose the language. You can use URL parameters to hide or show certain pages in you help site. These parameters help you to determine which content to show to which users. For instance, you can make certain documentation available to only one of you users “X corp” and hide the same documentation from other users. 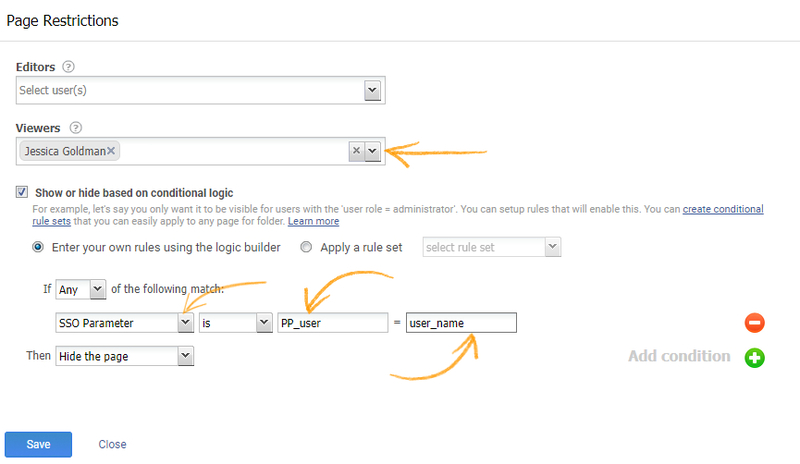 Select the users you want to restrict editing or viewing to and then select “URL parameter” to add the parameter. Similar to a URL parameter, you can pass an SSO parameter to your help site. When users login to your site, an SSO parameter is instantly sent to ProProfs. Based on it, certain pages in your help site are either shown or hidden from your users. 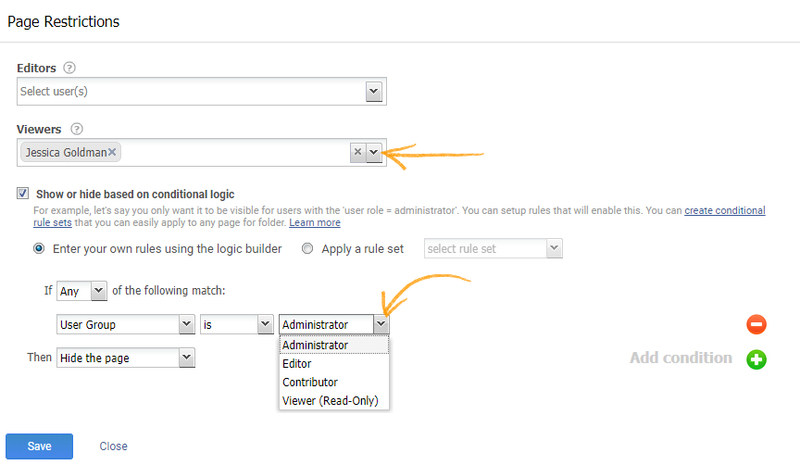 Select the users you want to restrict editing or viewing to and then select “SSO parameter” to add the parameter. 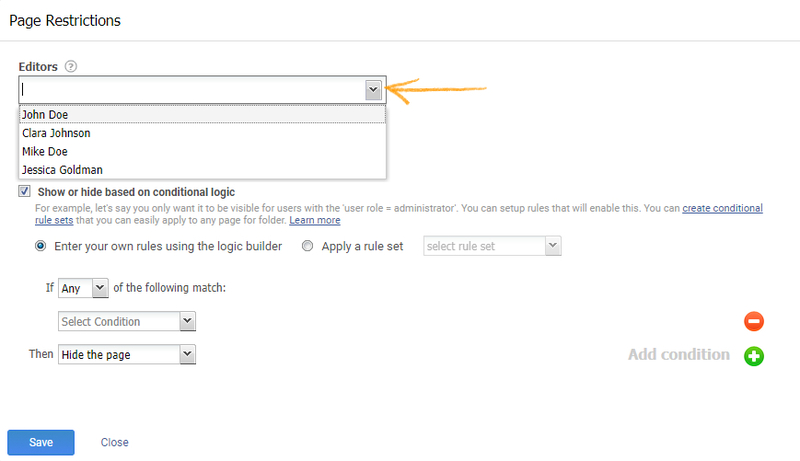 You can restrict users from editing or viewing the page based on the role of the user. Select the users you want to restrict editing or viewing to and then select “User Role” and choose the role of the user.